From Little League fields in Ft. Walton Beach and Jacksonville, and junior high and high school gyms around Jacksonville, Gene Deckerhoff grew up around sports. As a kid he kept home made score cards on baseball games broadcast over radio. He was honored as a Little League All-Star, and named Basketball All-City as a senior at Forrest High School in Jacksonville. His 32 points in a game against Lake City HS was a school record that stood for several years. As a freshman he was the starting point guard and second leading scorer on the St. Johns River Junior College Vikings basketball team that won the State Junior College Championship. Gene began his broadcasting career as a direct result of his sports participation. WWPF – Palatka Program Director John Tilghman was also the stations sports play-by-play announcer. He offered Gene a job as a weekend announcer. And in 1964, Gene successfully passed the FCC License exam for broadcasters and began working “behind the mike”. His first sports assignment was as engineer/announcer of a Little League All Star game in Palatka during the summer of 1965. After four and a half years in management and sales with Southern Bell Telephone and General Foods Corporation, Gene re-started his broadcast career at WTRL in Bradenton, Florida. He spent a year as a weekend “part-time” announcer, and then began full time work at the station in 1972 as a DJ, account executive and sports announcer. His first football broadcast was in the fall of 1972 when he shared the play-by-play chores with News Director Dean Edwards. WTNT-AM, Tallahassee, Florida was Gene’s next stop. He became the basketball voice of Florida State Univeristy in the winter of ’74 sharing play-by-play duties with Ed Littler and became sole play-by-play announcer in '75. Gene began his television career in September 1976 as the original Sports Director at WECA-TV channel 27, an ABC affiliate in Tallahassee. He continued to broadcast daily 2 minute radio sports shows on WGLF-FM in Tallahassee. In January 1978, Gene became co-Sports Director at WCTV-TV, channel 6, a CBS affiliate in Tallahassee. In 1979 Gene auditioned for the FSU Football Play-by-play job. Among the finalists for the position was the late Tom Meese (ESPN) and Craig Sager (Turner Sports). In 1980, Gene co-hosted the weekly "Bobby Bowden Show". The program was produced by WCTV and distributed state-wide during football season over a seven station network. In November 1983, Gene was named Director of Electronic Media for Seminole Boosters Inc. His primary duties were coordination of the Seminole Radio Network, and Executive Producer of "The Bobby Bowden Show"(football) and "The Pat Kennedy Show" (basketball) on television. He sold advertising, negotiated all TV contracts with stations throughout Florida and in Atlanta, and acted as talent on both shows. He also began producing "Great Moments in FSU Football" with Burt Reynolds. The Great Moments Series debuted in the Fall of 1984, and continued through 2009 (26 seasons). During 1983-85 Gene was the play-by-play "Voice of the Tampa Bay Bandits" of the USFL. Gene teamed with his FSU color analyst Vic Prinzi for the three years the summer league was in existence, broadcasting many memorable games coached by Steve Spurrier. In 1989, Gene was named "Voice of the Tampa Bay Buccaneers". He joined Jessie "The Body" Ventura and Al Keck as the Buccaneers broadcast team on WRBQ-FM and the Buccaneer Radio Network. In 1991, WQYK (Infinity Broadcasting) acquired the broadcast rights and Gene continued as the play-by-play. 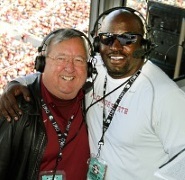 He was joined, in the booth, by former Buccaneer Defensive Tackle Dave Logan. In 1999, former Buccaneer Linebacker Scott Brantley was named Color Analyst. Ronnie Lane was named side-line announcer. In 2004, WDAE-AM and WSUS-FM (US103.5) became the new flagship stations for the Buccaneers. Former Buccaneer Linebacker Hardy Nickerson joined Gene as analyst for that season. And in 2005, former Tight End/Long Snapper Dave Moore became Gene's partner in the booth. T.J. Reeves became his new side-line reporter. In 1990, Gene started Gene Deckerhoff Productions. Obviously specializing in sports play-by-play announcing - with contracts with the Florida State Seminoles (IMG Collegiate) and The Tampa Bay Buccaneers. Gene produces radio commercials and acts as talent in various television commercials. He also is an "in demand" speaker for sports organizations and corporations. Gene has broadcast five National Championship Games for Florida State, and in 2002 he broadcast Super Bowl XXXVII from San Diego over the Buccaneer Radio Network. With the Buccaneers 48-21 win over the Oakland Raiders, Gene became the ONLY "team radio voice" to have broadcast for a Super Bowl Champion and a National Football Champion. In 2000, Gene was inducted into the Florida Sports Hall of Fame (Auburndale). In 2002, Gene was inducted into the Florida State University Athletics Hall of Fame. And in 2004, Gene was inducted into the Florida Community College Activities Hall of Fame. He was been named Florida Sportscaster of the Year by members of the National Sportscasters and Sportswriters Association 14 times. And for 18 consecutive years was named the Best Play-by-Play Announcer in Florida by the Florida Sportscasters Association. He was honored with the Florida State University Circle of Gold Medal for outstanding service to the university. In 2013, Gene was presented with the "Chris Schenkel Award" by the National Football Foundation, and the College Football Hall of Fame. The award recognizes long and distinguished careers in broadcasting college football. In 2017, iHeart Media's 98 Rock-97.9FM became the Flagship Station of the Buccaneer Radio Network. Gene is the father of three sons and six grandchildren. He and his wife Ann reside in Tallahassee. It's a great day for a ball game! 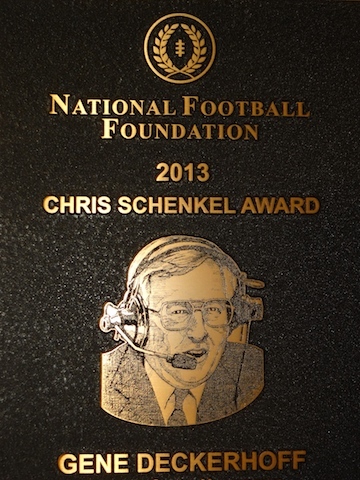 2013 National Football Foundation "Chris Schenkel Award"